"Ueda Soko Ryu" which will be held tomorrow. From the ryureiseki, tea room with chairs is named "Fujimi tei"
which means "Mt.Fuji visible room" you can see Mt.Fuji when the weather is fine. it's said to be the best Ryureiseki in Japan. so I thought the cleanliness like this is necessary for my room too! Yo ho ho! Aikido has a term for Kokyu-ryoku which literally means power of breathing. Kokyuho is the way to build up Kokyu-ryoku. But this "kokyu" has no relation with breathing. This "kokyuryoku"is hard to explain even by the Aikido expert. Kokyuryoku is a kind of releasing the unnecessary pressure. In a word "qi", in few words "how to move physically". Far away to second grade..
two-four time during the drum part. 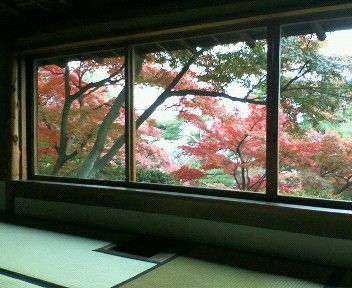 I peformed at Sawanoya- ryokan inn which accept foreign tourist actively. The student of Hosei University came to reseach for their seminar at University. 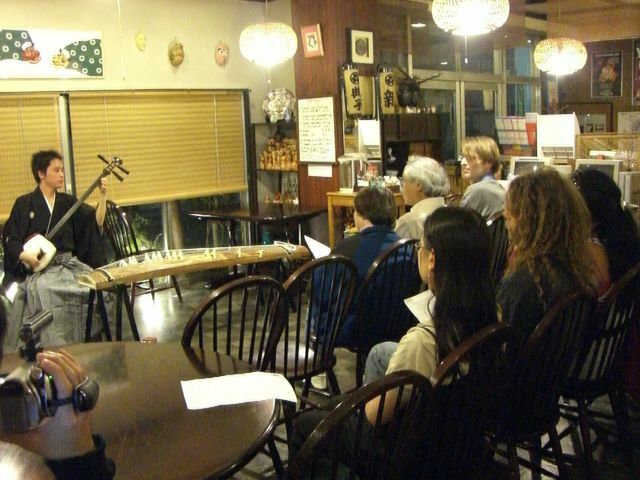 I play Akatonbo(dragonfly)and Amazing Grace in medley as a introduction. The third photo is Jenifer from Brazil. She plays piano or violin ,so she is intersted in Koto. I said " Any questions!?" he don't have trouble in listening. I asked to the couple from Boston which song was better. They like shimauta in Sanshin. The program was best choice!! I think it was worth it!!! so I talked to a friend of mine about it. is the tecniques of Shirakawa Guchpachiro." and Shirakawa Gunpachiro made it perfect. and had many students. For example, Mihashi Michiya learned from him. so I will start with copying and making score of Shirakawa-Gunpachiro. "You take test in,,, straw doll!?" "No, I will take in CLAY doll"!!! How scary!! Yo ho ho!